Kendra Key has always been a force for positive change. She started recycling programs at both her high school in her hometown of Tuscaloosa, Alabama, where she was the class valedictorian, and at the University of Alabama. “We didn’t have recycling in the Tuscaloosa City Schools, so I started a pilot program at my high school,” Key said. The pilot was so successful—“We collected 11,000 bottles!” she recalled—that Key expanded the program to other schools and then used it as a model to expand the recycling program at the University of Alabama. 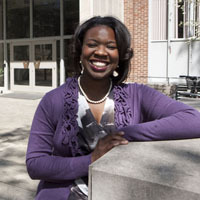 As an undergraduate, Key majored in political science and environmental studies; served in student government, ultimately as chief policy adviser; and was selected as a Truman Scholar during her junior year. The Truman Scholarship Foundation provides funding for graduate study to students who demonstrate leadership ability and a commitment to service along with academic accomplishment. “The program brings together students from across the nation who are committed to public service, and I Iiked that,” she said. She also came within a few hundred votes of being the first black woman to be elected student body president and the first black student body president since 1976 and received the Algernon Sydney Sullivan Award, the university’s highest recognition, as a senior. After graduation, Key moved to Washington, D.C., to work as an intern at the Department of Health and Human Services through the Truman Scholars institute. 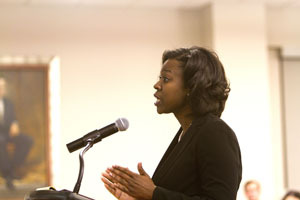 She then took a job as the legislative coordinator with the District of Columbia Public Schools. Seven months later, she was tapped to join the staff of Representative Terri A. Sewell, newly elected to Congress from Alabama’s Seventh District. “Working for a freshman member of Congress meant I got to do a lot,” she said. “I worked on issues primarily related to education and environment, among others.” When her hometown of Tuscaloosa was flattened by a deadly tornado in April 2011, Key found herself “working with people on the ground” to help with the recovery. 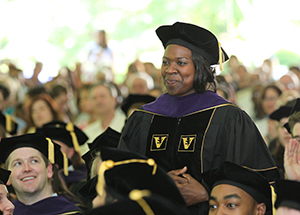 Her two years in Washington whetted her desire to become a lawyer. Key joined the Black Law Students Association at the beginning of her 1L year and served as BLSA president as a 2L. Winning the Moot Court competition with partner Robin Frazer ’15 (BS’12) was another highlight of her 2L year. “We were a great team,” Key said. “Robin is one of the smartest, hardest working people I’ve ever met, and I’m a better law student by having been her partner.” Key also won the competition’s Best Oralist award, and she is serving as Chief Justice of the Moot Court Board and as symposium editor of the Environmental Law and Policy Annual Review in 2014-15. She is also a member of the Legal Aid Society and has taken the Pro Bono Pledge, through which students commit to 75 hours of public service during their three years of law school. As a 2L, Key particularly enjoyed her Law and Policy seminar with Ganesh Sitaraman. “We looked at cases dealing with gay marriage, voters’ rights, the Affordable Care Act, immigration and drones. For my final project, I chose to review the Alabama Accountability Act—essentially a school voucher bill—because I’m interested in education policy,” she said. During summer 2014, Key worked at the Alabama Attorney General’s Office, at Maynard Cooper and Gale in Birmingham, and at Boardman Carr Bennett Watkins Hill and Gamble in Chelsea, Alabama. During the commencement ceremony, Key was recognized for receiving both the Bennett Douglas Bell Memorial Prize and the Chris Lantz Award. During 2015-16, she is serving as a law clerk to Judge David Hamilton on the U.S. Court of Appeals for the Seventh Circuit in Bloomington, Indiana, whom she met when he came to Vanderbilt to judge the final round of the 2014 Moot Court competition.